China estimates its oil reserves reached more than 88 billion tonnes after some 12 billion tonnes of crude oil has been discovered since 2008, according to the Ministry of Land and Resources. The latest statistic showed the country's oil reserves, including about 23 billion tonnes of mineable reserves, have increased 15 per cent since 2003, China Daily reported. China's oil discoveries have been increasing steadily in recent years as it has been ploughing its investment in oil and gas exploration, which rose from 19 billion yuan (US$3 billion) in 2002 to 67 billion yuan in 2011. 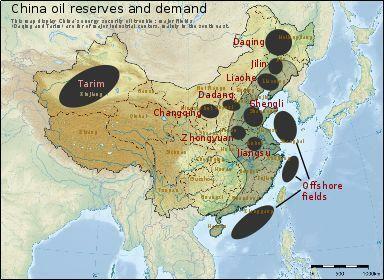 The new oil discoveries were mainly in six basins, including the offshore Bohai Bay, the Ordos Basin in the Inner Mongolia autonomous region, Sichuan, and the Beibu Gulf region, it said. China alone accounted for 71 per cent of energy consumption growth last year, according to the BP Statistics Review of World Energy 2012. Meanwhile, its natural gas reserves has increased 49 per cent to 52 trillion cubic metres compared with 2003, including 32 trillion cubic metres of mineable resources.